This is the third in a three-part series on glass fishing floats featuring Stu Farnsworth. 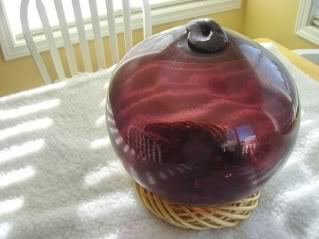 Stu Farnsworth has been an avid beach comber and collector of glass fishing floats for well over 30 years. Stu is a well-known expert on glass fishing floats, Japanese and otherwise. He has a love for his hobby and the ocean and enjoys communicating with fellow glass fishing float collectors AND sea glass enthusiasts like us. Not to mention he is one great guy! Lin: What's the most unusual thing you've found while beach combing? Stu: That would involve two experiences actually. The first experience: November 3, 1979, I was at Cape Lookout State Park. I hit the beach at 12:30 a.m. The weather was windy and the showers were coming down in squalls. When it wasn't raining, it was clear and the moon helped to light up the beach. The tide was coming in very hard, so it took a while before I could get onto the beach because I had timed it to be there as the tide was turning from high to low. Cape Lookout is about 5-6 miles to the point one way. I found a lot of debris on the beach and was pretty excited about the fact that I would probably find glass floats. 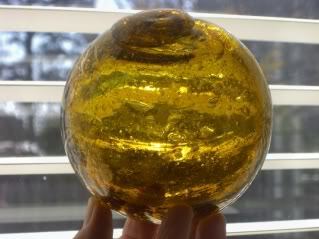 Glass Fishing Floats - This is an ultra rare American Doughnut Float made by Northwest Glass Co out of Seattle, Washington. There are only supposed to be 12 of these ever made. Note the hole or tube running through the middle. These were way too expensive to make, thus such a low production. About 4 miles into it, I found my first float but the odd thing was I was finding clothing and emergency supplies, such as ration water, in boxes along with flares. By the time I reached the end of the spit, I found another float and so I had two. I knew it would be better going back because the tide was now all the way out. About a mile back, my flashlight shone on something large and strange on the beach. I was somewhat nervous as I was out there all by myself. I came upon a lifeboat completely turned over. I was scared but decided to try and lift it up to see if anyone was inside. This lifeboat was about 20 feet long and about 8 feet wide. I yelled to see if anyone would answer and got no response. I was finally able to lift it up enough to see that nobody was in there. It was quite an experience to see this massive lifeboat on the beach. 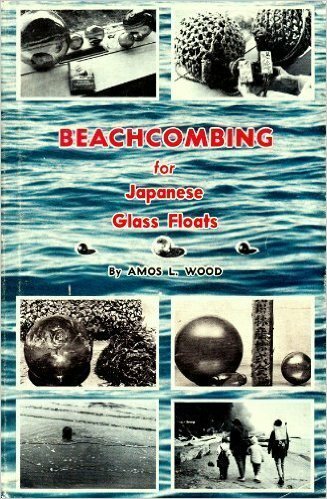 Glass Fishing Floats - Grapefruit-size Honey Amber Japanese Long Line Cod float with thousands of bubbles, very old glass. Here's how the story ends: When I got back to the park around 5 a.m., I called the Coast Guard to let them know. They came and got the boat. What had happened was the lifeboat had gone overboard from the deck of a Liberian tanker along the entrance into the Columbia River. The currents had pushed the lifeboat that far south. 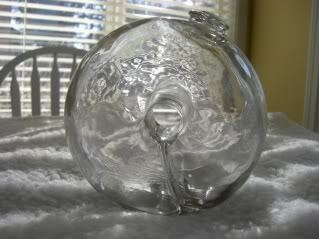 A "roller" glass fishing float with a cobalt seal. The second experience: One night I was on the beach in a wild storm with the beach covered with foam. When it's like that the only way to look for the floats is to have a good walking stick. As you walk, you run the stick along the high tide line. As I was doing this, I ran the stick into a sea lion. It made a horrific sound and leaped at me. Let me tell you there is nothing quite like that at 1 a.m. on a dark beach to scare the living daylights out of you. 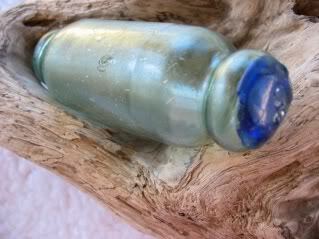 Glass Fishing Floats - Here is a collectors Gem. An actual Authentic Deep Purple Japanese Long Line Tuna Float. 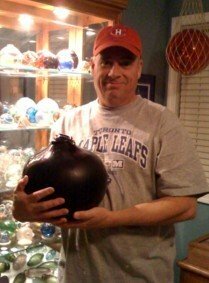 This is basketball size and was found by a Coast Guardsman on Port Heiden, Alaska, as he waded out into the ocean to get it in 1954. Lin: Oh, my! Talk about getting the adrenaline going. You've certainly had some unique and strange, not to mention hair-raising, experiences. Now, getting back to normal daily life, how would one go about getting your book, "The Collector's Price Guide and Identification Handbook, Glass Fishing Floats of The World"? We love receiving your comments, but please read the notes below before posting. Thank you! All comments are moderated. If you leave the page you won't see your comment until it is approved. Select the "Post to Facebook" check box to be notified on FB when a reply has been posted. If you scan the previous comments you may find an answer to your question. Click the "View X more" link at the bottom (if visible) to see all comments. Photos - If you would like to include a photo, please use our Photo Forums. Questions - If you have a question, it may already be answered. Please tap or click here to search of our site first. Wrack - an ancient word with likely the same root as "wreckage," referring to debris washed up on a beach. Wrack line: the line of seaweed, refuse, driftwood, and "wreckage" found at the high tide line on a beach.